We have seen the enemy and he is us. So were the immortal words of the great American philosopher Pogo, the satirical cartoon creation of Walt Kelly. That droll quip speaks to a dark sinister reality about what is happening in the Jewish world, in direct contrast to the warning offered by Parshat Tzav. God directs Moses to command the priests on what to do and how to do it as they fulfill their sacred responsibilities on behalf of the people Israel. It is clear that the sacred tasks require special ways of acting. There is too much at stake; for these are the priests making offerings to God on behalf of God’s people. The priests learn the strict code to which they must adhere. Deviating is not acceptable, and the consequences can be severe, as Nadav and Abihu will learn. Later on, we learn that the nation itself is a nation of priests. That we as a nation are similarly charged with a series of behaviors that are required of us to fulfill our responsibilities. These laws are put forward in Torah and then developed by the rabbis and shared in the Oral Torah and the great works that expound upon these laws. Like our priestly class, the nation of Israel is bound to the laws of Torah on how to act in order to fulfill our sacred responsibilities of being a light to the nations. That light has been dimming as a result of a move away from our role as faithful servants to something that embodies a hubris endangering and attacking our core values as a people. We have moved from the sacred work of Sanctifying God’s name to profaning God’s name, from Kiddush ha-Shem to Hillul ha-Shem. At the most recent Rosh Chodesh at the Kotel we witnessed a brutal and tragic display of violence against the Women of the Wall. We do not agree on how we should engage in ritual. I respect other approaches to Judaism, even though I do not practice them. Likewise, there are many who would see my religious practice as unacceptable. However deep the disagreements may be, there is no justification for the violence perpetrated on the Women at the Kotel. I would argue that the shouting is an undermining of the special space that is the Kotel and place. But physical battery is blasphemy, plain and simple. It curses God’s name and everything that Judaism is supposed to represent. In the name of the sacred, everything sacred has been trashed, God’s great name was trampled in the mud. 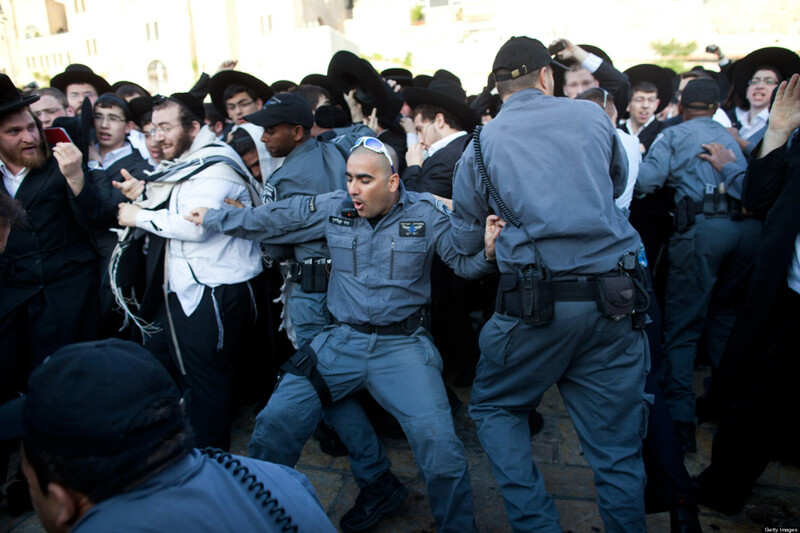 The violent encounter was in violation of all of Jewish Law and culture. This moment is a tipping point for us as a people. And this is not the only arena where our behavior needs to be critically examined. Tzav, commanded behaviors, require adherence to standards of decency and ethics. Are we acting as God has directed? The rise of racism in Israel is an insidious cancer eating away at the very soul of the State. This racism dehumanizes the non-Jew, whether they be citizens of Israel or Palestinians of the West Bank and Gaza. The inability to see the other as one with fundamental human and civil rights, entitled to dignity and respect, undermines the ideals of both the Jewish State and the Jewish religion. The violent racist Kahanists, Otzmah Yehudit, have a new-found acceptance in Israeli politics. The inclusion of these groups dedicated to an extreme racist view, enforced by thuggery, should be unthinkable, but instead of repudiating them and everything they stand for, they are legitimized and welcomed. There are appeals to the courts seeking redress, but ultimately the Israeli people must speak out unequivocally against this base and baseless hatred. This issue also confronts American Jewry. As anti-Semitism is on the rise, American Jews must respond. The manner in which we move forward will determine if we are no better than those who hate us. Can we be strong and resolute without resorting to similar tactics as those whose ideas we find dangerous and contemptible? Can we find sufficient security in this extraordinary place and time in our history to battle anti-Semitism and not feel disenfranchised by those contemptible people on the margins of society who seek to do us harm? The second temple was destroyed, our sages say, due to Sinat Chinam, the baseless internecine warfare that existed within the Jewish people. Instead of a tolerant society with many different interpretations of Judaism, the People of Israel became a fractious group of competing sects intent on imposing their particular view on everyone, ultimately sacrificing everything. Can we reclaim the ideals of Klal Yisrael, or is history repeating itself? Our leaders from across the breadth of our tradition including Rabbi Nachman, the Hasidic master, Rav Kook, the founder of religious Zionism, and Rabbi Abraham Heschel, an American Prophetic voice, to name only three, all warned against hatred against others, no matter how deeply offensive we might find certain practices. They encouraged us to embrace the best of our tradition so that we may bring forward our values in the world. Tzav, as part of the book of Leviticus, as part of Torah, lays out the rules for how to act as a people in sacred service to God. These rules are based on core values that are central to every expression of Judaism, religious, ethnic, and cultural. When we violate the values that are at our core, we betray the sacred aspirations of our tradition. Tzav reminds us of our duties and sacred obligations and admonishes us not to stray. Tzav demands more of us, we need to take heed and act better. Rabbi David Levin is the founder of Jewish Relationships Initiative (JRI), a 501(c)3 focused on outreach, meaning making, and the challenging end-of-life journey. He has re-imagined the Ethical Will, found online at: ConversationsForLifeAndLegacy and JewishRelationshipsInitiative. He also teaches with noted colleagues, a lecture series exploring Jewish Wisdom throughout these demanding life phases. David Levin is a Fellow with Rabbis Without Borders and makes his home in Philadelphia with his wife Naomi. What If Accepting LGBTQ People Is A Matter Of Life Or Death?